My favorite looks of the day came from four different shows. First up – a couple of looks from Felder Felder. The shape of this skirt could read a little "cheerleaderish" - but I think the use of metallic blue leather makes it more interesting. The color orange is making an appearance here in London as well. 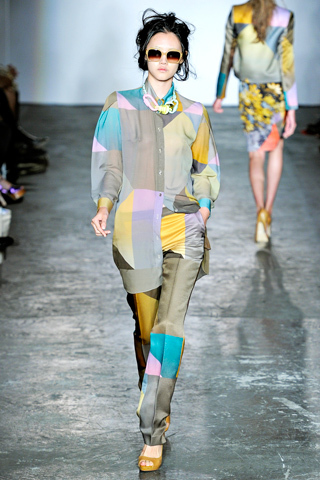 Here it is at the Jean-Pierre Braganza show. Bass & Brooke amused me with this really fun color-block jumpsuit. 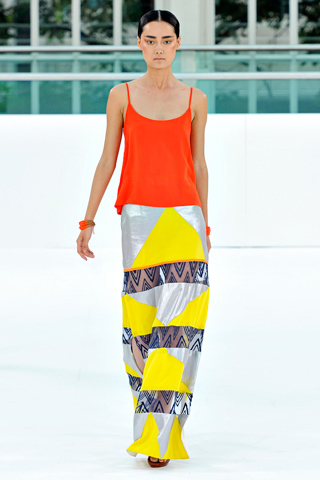 Sass & Bide’s use of color and pattern made it my favorite show of the day. I think the mix of patterns works well together, and I really like that the skirt is longer in the back. This would be darling paired with simple black ballet flats. 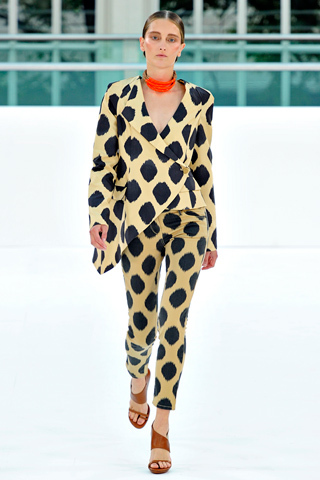 I would throw this on, put my hair in a pony, and hit the streets for a fun - but chic day look. Love the brights paired with the metallics. It is obviously a loud look - but it still has an easiness to it because of the cut. hey Morgan, I have tried to leave 2 other comments but it wouldn’t let me. Lorna also tried and it rejected hers too.